Plenty of outstanding performances came out of the Bernie Magee Class Meet Saturday morning. Check back as our race videos and photos begin uploading later this evening. Despite not having their top runner Chloe Gonzalez compete the defending Meet of Champions squad and NJ#1 ranked North Hunterdon girls showed their depth at Bernie Magee dominating the meet merge with a 19:29 average. They were led by Emily Nugent who won the senior race with the third fastest time of the meet at 18:36. She may have even gone faster if it weren't for a errant turn that took her off course for a bit leading to a longer distance covered. The fact that she still ranked third in the merge is an exciting sign of things to come. Her post-race interview led to more exciting news with the announcement of her commitment to Syracuse University next fall. Teammate Alexandra Carlson also won the sophomore division running 19:20. Westfield girls with 101 points and Ridge at 112 finished second and third in the merge. The overall leader for the girls meet was Daisy Liljegren of Northern Highlands running 18:13, she held off Julia Trethaway of West Morris Central, 18:21, to win the junior race. Liljegren now ranks fourth all-time on the course since its redesign in 2017, Trethaway up to sixth. Another story from this meet was Natalie Tyner, a state champ in North Carolina, unfortunately displaced by Hurricane Florence. The Laney HS senior is staying in New Jersey for the time being with family and was looking for a meet to open her season, she finished fourth in the senior race running 19:17 the eighth fastest time of the meet. The girls freshman winner was Orlins Madison of Mendham 12:30 over 3400m. On the boys side we saw plenty of fireworks as well. 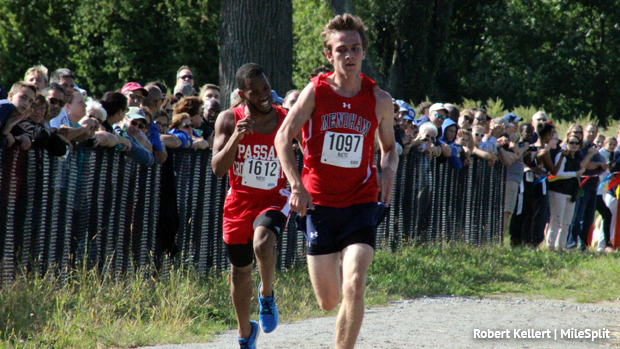 The senior race showdown between Mendham's Jack Stanley and Passaic's Luis Peralta did not disappoint! As they came over the crest into view Stanley had the lead and despite a very strong push from Peralta over the final 600m Stanley held him off to the line 15:40 to 15:41. The two fastest times of the meet! Benedictus Bago of Snyder, 15:52, and Ben Fleischer of Scotch Plains-Fanwood, 15:57, also in that race the only other two to run under 16 minutes in the merge. The Westfield boys led a close team score battle in the 5K merge over North Hunterdon 84 to 88. Both teams were very close in their top five split and average as well. Westfield split 22.9 averaging 16:31 and North Hunterdon 28 seconds averaging 16:32. The junior race was won by Luke Lusskin of West Morris Central at 16:04, sophomores by Will McGlynn of Westfield 16:32, and the quickest freshmen time went to Jackson Barna of Ridge HS who posted an 11:01 to win the 3400m Freshmen B race. Also a big shoutout to those at the Central Park of Morris County for accepting cross country with open arms. They've put in permanent fixtures just for cross country such as spectator fencing, wooden posts and ropes for finish chutes, and tirelessly working on improving the footing around the course.